You’ve got a great idea, now what? How to get innovation off the ground in your company? In the first course of our Service Innovation and Design studies we got to tackle the fascinating subject Design Thinking in an innovation process. 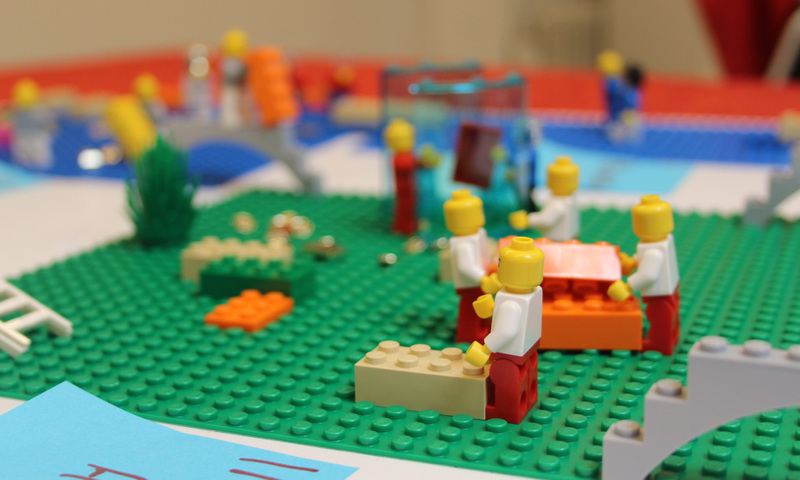 In class we developed a new idea to enhance learning at Laurea in groups of 4 or 5 people. Not only did we get a great exercise in team work, but also learned to use different DT tools such as interviews and observations techniques, brainstorming and brainwriting, mind maps and rapid prototyping, which are introduced in Katja Tschimmel’s article “Design Thinking as an Effective Toolkit for Innovation”. In the end we got a chance to present our new service concept to Laurea faculty members. I found the DL toolkit and The FORTH method of Gijs van Wulfen very useful and interesting considering my own work and projects in the company I work for. 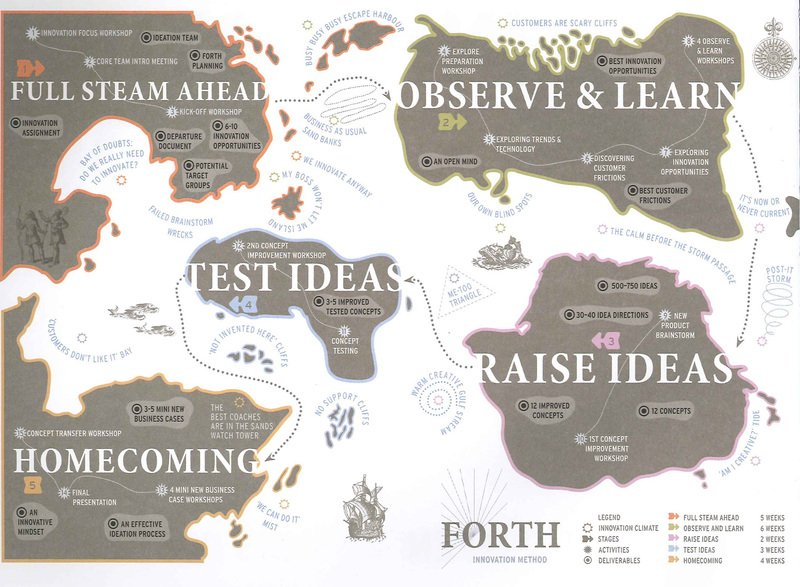 FORTH is an innovation method for creating new concepts. The chapter titled “Raise Ideas” explains how to develop great ideas and get internal support for them inside your company. Van Wulfen begins his book with words: “innovation is highly relevant to every organization. Yet, eighty percent of innovation projects never reach the market.” Everything might be working for you: it’s the right time to innovate, you are prepared and know the purpose and direction of the innovation, but still the project fails. Why? Often this is due to the lack of support from the management. You might not receive resources to complete your project or the management might not get behind the idea and rejected it. It is impossible to innovate alone in an organization! A great idea needs to be bought by – not only the public – but management, colleagues and employees of your own company as well. Your vision needs to be shared by everyone in your organization for it to be successful and the idea to come into fruition. How do we get support on the work floor? How to we create sponsorship on the top? How to we communicated ideas to the right people? Selling your idea inside your own company is not as easy as you might think. This is why team approach is emphasized in the FORTH method. In order to get everyone behind your idea it is important to “promote positive energy and cooperation within your organization by letting those colleagues, who will play a role in the development and introduction process, participate in the ideation of their own innovation. You have to give them a change to discover for themselves what different paths are possible, what can be developed and what is realistic.” When people can give their own input in the project, they will be more invested in it. In the classroom we discussed brainstorming and how it is are often viewed as frustrating and pointless, since nothing innovative comes out of the sessions. However, with the right team and right techniques, brainstorming can be very effective way to develop ideas. Choosing the right team might be challenging, but it is important to remember that the bigger the team, the greater the diversity. With the right people involved in the project you not only get intern support, but having people from different departments, you get new ideas as well as different qualities and expertise. Don’ bet everything on one horse! The FORTH book suggests that it takes 3000 raw ideas to get to one successful product. That is why you should never bet everything on one horse! During the Design Thinking course we developed new concepts using a structured creative process with warming-up exercises, brainstorming techniques and asking opinions from outsiders. It was very interesting to see how from 30 suggestions, the final idea crystalized. On the FORTH expedition we learn that using the right brainstorming techniques you should get over 500 ideas, then 12 best concepts get chosen to be worked out in smaller groups. In the end you should end up with 3 to 5 product ideas or service concepts that can be worked out as mini new business cases. It is very important to get everyone who has not been working on the project in the company excited about the new ideas. The final step is to make a creative presentation to management – and then just wait for the green light for your innovation! Innovation Expedition. A visual toolkit to star innovation, Gijs van Wulfen, 2014. Bis Publishers. Design Thinking as an effective Toolkit for Innovation. Katja Tschimmel. (2012) In: Proceeding of the XXIII ISPIM Conference: Action for Innovation: Innovation from Experience. This is true on many levels. Even when you are not trying to innovate-just tweak, you can see when an idea, usually new, is not going to get anywhere. It takes so many people from so many departments in an organisation to accomplish something that this is good advice even for smaller projects. I think as well that one of the most important things we learned in the first contact sessions was that no one innovates alone – and that not only means the idea generation stage but also getting everyone excited about the winning ideas that will turn into an actual product or service. For companies I think it is extremely important to find the right balance between single person approaches and “too many cooks spoil the broth”. I agree that this works best when clear ownership of any innovation process is a given but with initial ideas being collected from as many people in as many different functions as possible. Then narrow it down for the next stage until there are only those 3-5 ideas that are developed further. Everyone within the organisation should stand behind the winning ideas, which might be one of the most challenging aspects (everyone thinks their own idea is the best) on the innovation journey but definitely one that can be overcome as we also learned in the Design Thinking course. A new idea, invention or research result is not by itself yet an innovation. An innovation can be seen as an outcome of an succesfull idea (that has been commercialized or has some other benefits). I see that one of the biggest obstacles standing in the way of an idea becoming an innovation is, that many lack the experience and the motivation to carry the idea through to fruition. 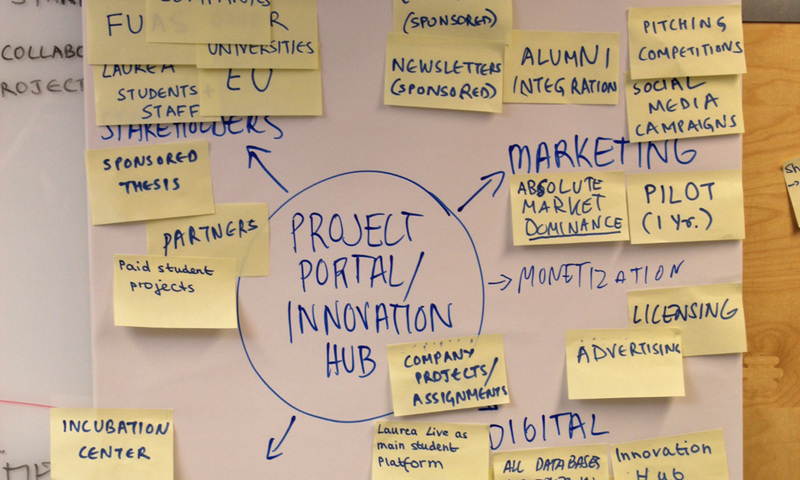 So it´s not enough to have a briliant idea – something needs to be done to transform the idea into innovation. And in order to develop an idea into innovation we need collaboration. As the author of this blog says: You cannot innovate alone. Thank you all for your comments! Even though collaboration is important in an innovation process, I really agree with the “too many cooks spoil the broth” aspect, since I have experience with a project going nowhere, since no one is in charge and there are too many people having influence and opinions on the end product. There needs to be an owner of the project with motivation to push it through. Perhaps there could less risk of ideas and innovations failing if customers and potential customers would have been involved right from the beginning and in every step of the process? In other words, if thorough service design approach would be utilised. I believe that by involving the customers in each phase of innovation, it enhances creating the type of innovations that the customers feel the need to use (and buy). This, naturally, demands much more resources, which posibly explains its current low utilisation.